After the long and draining read that was Blood Meridian, I was in the mood for something a lot lighter in tone. 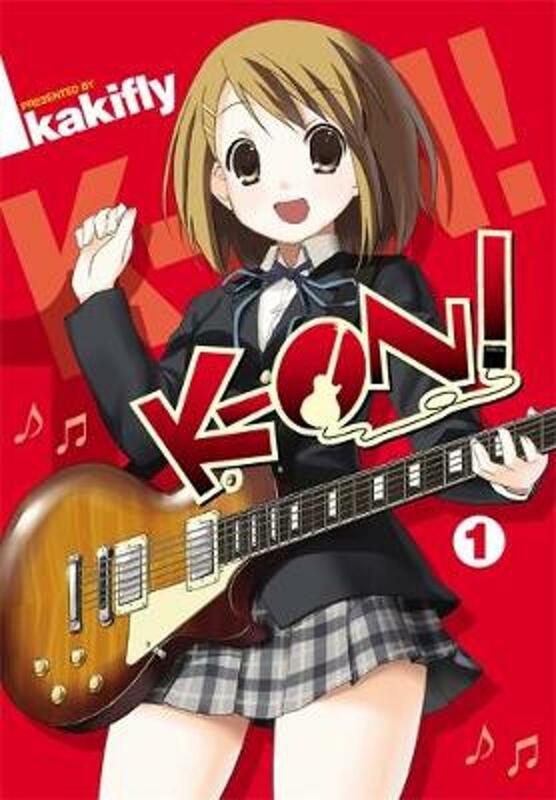 Enter the first volume of K-ON!, a series that comes highly recommended to me by my husband. Since I like what I've seen of the anime adaptation, and I needed something short, sweet and relatively harmless, it seemed like the perfect choice. K-ON! follows Yui Hirasawa in her first year of high school. When she's frightened into joining an extracurricular club for fear of becoming a NEET after high school, she joins the Pop Music club, assuming that it will be an easy ride. Unfortunately, her new club members assume that she can play the guitar, an instrument she has never touched in her life. But with determination, she and her new friends may be able to turn this failing club around. I was after something gentle, and K-ON! certainly delivers on that. There isn't really much in the way of driven plot, but then that's pretty much a staple of the slice of life genre. What the genre sacrifices in plot and serious conflict, it makes up for in characters, and K-ON! definitely has that in abundance. So the core of the cast is made up of the four members of the Pop Music club. As mentioned above, there is Yui, the inexperienced main guitarist. She's sweet and energetic, but nowhere near the brightest bulb in the box. There's Mio Akiyama, the studious and painfully shy bassist, who more or less has to adopt the straight man role out of the group. Self-appointing herself the new club president, despite having none of the qualifications necessary for such a role, is Ritsu Tainaka, the audacious prankster on drums. And finally, my current favourite, Tsumugi Kotobuki, the wealthy keyboardist who is outwardly the perfect gentle lady, but is more than a little risque in her thoughts. There are also some secondary characters, but the one that stood out most for me was the teacher acting as their club adviser, Sawako Yamanaka. She only agrees to advise the club after they threaten to reveal her past as a member of the Pop Music club during its speed metal period, at which point you realise that her sweet, gentle nature is just a mask for someone mildly terrifying. It's a beautiful moment. This volume covers the first year of the club, in which they mainly mess around and treat the clubhouse like a tea-room while Yui tries to get the hang of playing the guitar. It's cute so far, and I especially like what I've seen of them actually playing music, complete with comically terrible lyrics for their first original song. I'm a little sad that it does take a bit of a back-seat to your standard slice-of-life high school stuff, but I'm hoping that it will get a bit more music-focused as Yui and the others get more confident with their instruments.